Please be informed that the Polish Academy of Sciences terminated cooperation with the De Gruyter Open company at the end of 2017 and launched its own platform in Polish and English languages as Czytelnia czasopism PAN / Electronic Library Polish Academy of Sciences. The platform is available at www.journals.pan.pl. The publishing platform will be connected to the iThenticate anti-plagiarism system. 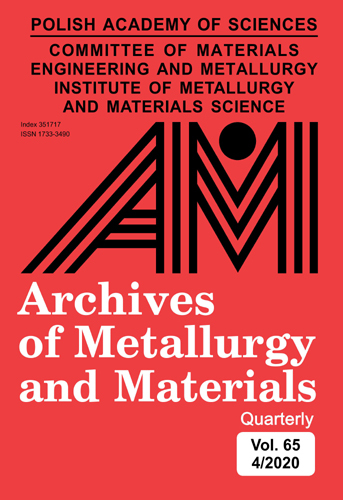 The archival issues of Archives of Metallurgy and Materials (from volume 57, 2012) will be available in the free electronic version on the DeGruyter Open website until the end of 2018, and for an unlimited time at the Electronic Library Polish Academy of Sciences. Notice: Currently, an estimated time from acceptance of manuscript to its publication is more than 10 months.